The much talked of 100 days of the ‘100 Days Program’ that was part of President Maithripala Sirisena’s election campaign is now completed. The President himself has come out with a statement which can be read as ‘observations on progress’ (see pages 4, 8 and 9). The Government claims that much was done. Others claim that it’s mostly talk and that nothing significant or lasting was achieved. There are two ways to assess performance here. The first is to go with items, divide the ‘done’ by the ‘promised’, multiply by 100 and come up with a percentage. The braggers can gloss over the importance or otherwise of each line item. They can ignore sustainability. For example, the cuts in fuel prices can be marked as a ‘plus’, but only if it translated into significant drops in prices of related goods and services (e.g. bus fares, school van fares, vegetables and other goods that require transportation). Factor these in and the brag loses its punch. මෛත්‍රිපාල සිරිසේන ජාතිය අමතා කරන ලද කතාවෙන් ඉතා වැදගත් දෙයක් කීවේ ය. ඔහු කියා සිටියේ ඒබ්‍රහම් ලින්කන් වහලුන් නිදහස් කිරීමෙන් පසුව ද ඇතැම් වහලුන්ට වහල්කම අවශ්‍ය වූ බව ය. අද ලංකාවේ සිදු වී තිබෙන්නේ එයට කිට්ටු දෙයකි. මහින්ද යටතේ වහල්කමින් මිදුණු අපි නැවතත් වහල්බව වුවමනාවෙන් වැළඳ ගත්තෙමු. ජනවාරි 8 වැනි දා සිදු වූයේ එයයි. ජනවාරි 9 වැනි දා පටන් ම බටහිරයන් අපට සලකන්නේ අප ඔවුන්ගේ වහලුන් බවට නැවතත් පත්වීම පිළිබඳ හටගත් සොම්නසින් ය. අප කතාකරන්නේ එලිසබෙත් වින්ඩ්සර් අත්වැසුම් ගලවා තමන්ට අතට අත දිම ගැන මෛත්‍රිපාල මහත් උජාරුවෙන් කතාකිරීම ගැන නො වේ. ඩේවිඩ් කැමරන් පැමිණ මෛත්‍රිපාල ඩවුනිං වීදියට ගිය රථයේ දොර ඇරීම ගැන පස්වණක් ප්‍රීතියෙන් පිනා ගිය මෛත්‍රිපාල ගැන ද අපි කතා නො කරමු. එහෙත් ජනවාරි 9 වැනි දාම බටහිරයන් අපට සලකන ආකාරය වෙනස් වූයේ කෙසේ ද? 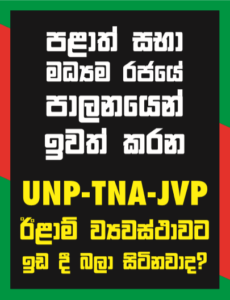 ඉතා පැහැදිලි ව එදා වහල්ලු නැවතත් වහල්ලු වූහ.